Seeks to weaken protections for shelter animals. This is not true. Holding periods were passed by prior generations of animal activists to protect animals. Why? Because for many animals entering Wisconsin shelters, the holding period is the only thing standing between them and a lethal injection. Holding periods buy shelter animals the most precious of all commodities—time. Time for their families to reclaim them, time for them to be adopted, time for them to be saved by a rescue group. Indeed, rather than shortening the stray holding period, we should be adding a holding period for “owner relinquished” animals who have no holding period of any kind. Right now, such animals can simply be taken directly from the front counter where they are surrendered to the killing room without ever being offered for adoption. And we should make both holding periods smarter. In other words, Wisconsin can achieve the same outcome Best Friends claims to be seeking—shorter length of stay and more lifesaving—without sacrificing the lives of animals by enabling those looking for reasons to kill them more quickly. 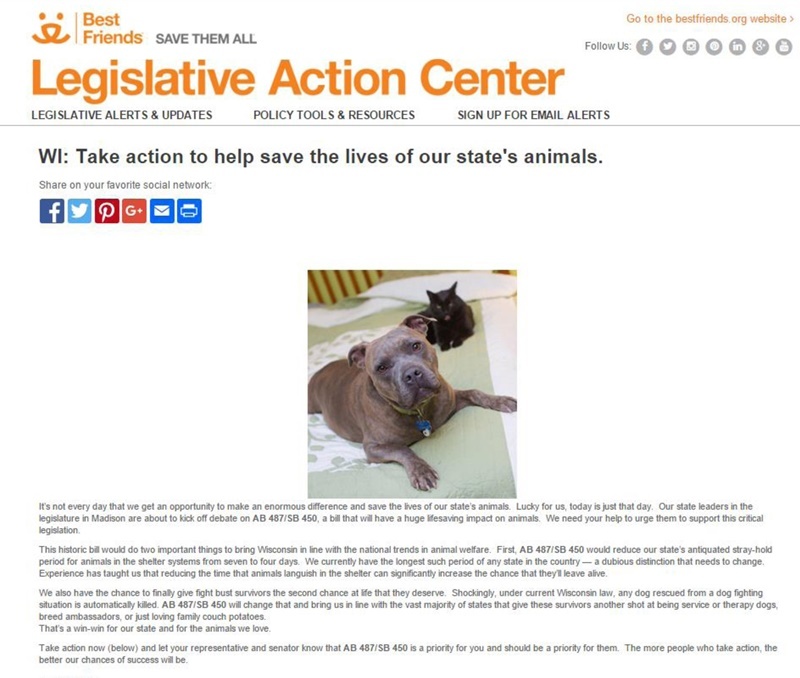 In fact, an advocate who is fighting this legislation notes that the Saulk County Humane Society in that state is run by a director who “believes that ‘killing is kindness’ [and] will kill animals on Day 5.” In other words, shelters are just, if not more, likely to kill animals faster than using the shortened holding period to get them out quicker, a point not lost on people dedicated to increasing redemption rates such as Lost Dogs of Wisconsin. Despite Best Friends attempt to portray a seven day stay in a shelter as “languishing,” it is less than the time than many animals spend in boarding kennels while their families are on vacation. Indeed, the average length of stay for animals at the best performing shelters in the country is roughly 14 days; in some, it is longer. Should those animals be killed instead so they do not “languish”? Or is seven days not too much to ask to try to get animals out alive and give them as much as 15 years in a loving home? If even our nation’s most successful shelters need an average of two weeks to launch animals into their new lives, it is deeply irresponsible, even reckless, to overturn existing protections for shelter animals on the naive assumption that the average Wisconsin kill shelter will do better than the average No Kill shelter and use the evisceration of such protections to save lives, rather than to enable faster killing. Moreover, this bill uses a sledgehammer to fix a problem that can be cured with a scalpel. If the goal of this legislation is to further quicker positive outcomes for Wisconsin’s shelter animals, that end can be achieved through a bifurcated holding period that allows animals to be returned to their family, transferred to rescuers, or adopted sooner, while protections that would prevent them from being killed are kept in place. Holding periods do not have to be an “either-or” proposition: either they are longer or they are shorter. They just have to be smarter, offering the best of both worlds without further imperiling already vulnerable animals. Don’t the animals of Wisconsin deserve that? (1) Animals impounded without identification shall be held for owner redemption during the first four days of the holding period, not including the day of impoundment, and shall be available for owner redemption, transfer, and adoption for the remainder of the holding period. (2) Shelters may transfer an animal impounded without identification at any time after impound to an IRC Section 501(c)(3) not-for-profit organization that is a (i) animal rescue group, (ii) private animal shelter, or (iii) organization formed for the prevention of cruelty to animals, as long as potential owners are afforded the same rights of reclamation as if the animals were still in the shelter. a. Whenever an animal is transferred pursuant to this provision, a photograph of the animal and all information pertaining to the animal’s impoundment and transfer (including the location where the animal was found, the date of impoundment, the date of transfer, and the name of and contact information for the receiving organization) shall be maintained in electronic, searchable and publicly reviewable form at the shelter and on the shelter’s website at least until the end of the reclamation period. (3) An owner that satisfies a shelter’s reclaim requirements before the expiration of the holding period is entitled to reclaim the animal even if the animal has been transferred pursuant to subsection (a) (2) and is no longer physically in the shelter’s custody. At the owner’s discretion, the owner has the right to physically redeem the animal at the shelter. (4) An IRC Section 501(c)(3) organization which receives an animal pursuant to subsection (a)(2) must return the animal for reclamation pursuant to subsection (a)(3) and is liable to the owner for failure to do so. (b) The required holding period for an owner relinquished animal shall be seven business days, not including the day of impoundment. (1) The animals shall be available for owner redemption, transfer, and adoption for the entirety of the holding period. (c) The holding periods required by sections (a) and (b) of this provision do not apply to cats who are impounded solely for the purpose of sterilization and are then returned to the location where they were found. (d) An animal who is irremediably suffering physically shall be euthanized without delay, upon a determination made in writing and signed by a veterinarian licensed to practice medicine in this state. “Irremediable physical suffering” means an animal who has a poor or grave prognosis for being able to live without severe, unremitting pain even with prompt, necessary, and comprehensive veterinary care. Note: This isn’t the first time for Best Friends. It should, however, be the last.